11 usuário(s) online no nosso site neste momento! Brazil has one of the biggest potential markets in the world for cruise ship guests (for the Brazilian Cruise ship season catered for Brazilian guests and for the cruise ship market worldwide). Just for example, the Brazilian people is the second biggest expend of US dollars at Disney world in Florida. As far as the country as a destination for ships catering for international guests sailing through Brazilian waters during it’s south American season or segments of world cruises, the country offers ports of call with exuberant beauty, culture and structure with the potential to delivery to the foreign flag cruise ship and it’s international guests a remarkable experience to enjoy fully it’s culture, beaches, nature, various valuable shore excursions and it’s warm people with safety (yes, safety is a major concern for all local governments welcoming cruise ship guests in Brazil). The good side is that Brazil today is the 8th largest economy in the world, producing and exporting from A to Z, Latin America leader with such a large economy that it creates the downside that it can be a very complex country with a net of immigration, customs and health laws & regulations that may make the understanding for a cruise ship company quite difficult and that’s why we offer a consultant service for your cruise company planning to visit Brazil with it’s international guests or to make even a larger project to bring a ship catering for the Brazilian guests and for the Brazilian cruise ship season. Brazil and it’s potential for cruise ships is a fact and the proof is that this season the country will have 8 foreign flag ships (MSC, Costa Cruise line, IslandCruises and Pullman) during the South American season from November 2005 to March 2006 catering for Brazilian guests with an average of 92% occupancy plus 2 foreign flag ships based in Brazil 365 days per year also catering for Brazilian guests. To maintain a ship in Brazil catering for Brazilian guests, there is some laws & regulations that a cruise company must follow and one of them just as an example is if a ship stays in Brazilian waters over 90 days before June 2006 and 30 days after June 2006 one third of it’s crew must be Brazilian born working onboard the ship. - Attending: Dr. Rene Hermann (Costa Cruzeiros), Mr. Eduardo Nascimento (Sun&Sea), Mr. Adrian Ursilli (MSC Cruzeiros), among others. Be a Star program is a seminar/lecturer based on my experience for over 20 years with the Cruise Industry. Powerfull complemente trainning tool focus on guest service, crew mentality and above all, Guest Satisfaction. Dealing with local authorities, the real infra-structure available for the cruise ship, guests and crew plus the improvements needed, reception quality at each port of call by tour operators, taxis and local business, cruise ship guests safety, business possibilities for the cruise company (creation and development of the project “port lecturer” with store maps with commission system for the cruise company and it’s shore excursions availability and improvements needed). Ship’s start up debuting in the Brazilian market and catering for Brazilian guests. Training to the foreign and Brazilian crew and staff covering the diversity, taste, culture and understanding the Brazilian cruise ship guest onboard during Brazilian season catered for Brazilian guests. Creation and development of printed material and video in foreign languages in a partnership with the sponsorship of the local government to be given onboard the cruise ship prior to it’s arrival. Possibility to produce and present onboard in foreign languages onboard port talks or in video about each port of call. Development of new shore excursions to attend the cruise company needs working together with the cruise company shore excursion department to develop the onboard sales system and shore excursion list based on the Brazilian cruise ship guest reality for cruise companies catering for the Brazilian season. Development of new shore excursions to attend the cruise company needs working together with the cruise company shore excursion department to develop the shore excursion list for cruise ships catering foreign guests and visiting Brazilian ports of call. Cruise ship "Shore Excursion Department"
Cruise ship "Cruise Director & Hotel Director"
Onboard consultant for the onboard management about Brazilian authorities, clearance, laws, regulations and safety and for cruise ships sailing through Brazilian waters with foreign guests. Port talk in English/Spanish/Italian/German about ports of call, shopping and shore excursion (if required by the cruise company). 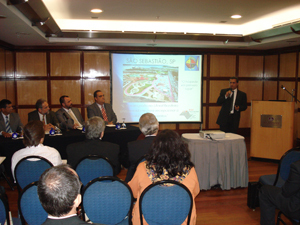 Creation and development of maritime, infra-structure and shore excursion printed material/video (port of call operating plan) to promote the county as a port of call for potential cruise chips catering for Brazilian guests and potential cruise ships catering for foreign guests. 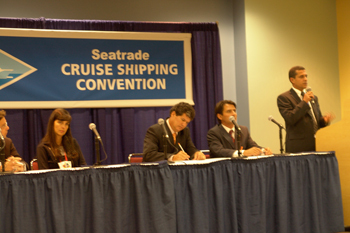 Representing your county to the cruise companies based in the United States and Europe with the creation and development of printed material and negotiations with the cruise companies to promote your county as a port of call during the The international exhibition and conference serving the cruise industry – Seatrade Cruise Shipping Convention in Miami, Florida. Introducing your product or service to the cruise companies based in Europe and United States. Onboard store maps (port lecturer program) based on commission to the cruise company. Marco A. Cardoso: Graduated by Hunter College & NYU – New York, NY with large experience onboard cruise ships as port lecturer, shore excursion manager, public relations, dive manager and cruise director working for various cruise companies at the following itineraries: Europe, North America (east & west coast), South America (east & west coast) New England & Canada, Hawaii, Greece, Turkey, Alaska, Asia and world cruises.